Sometimes spotting wildlife or for that matter, not spotting wildlife can be pretty dangerous. I remember floating down the Nile in Uganda minutes before an Egyptian cobra swam past the raft I had just jumped back into. 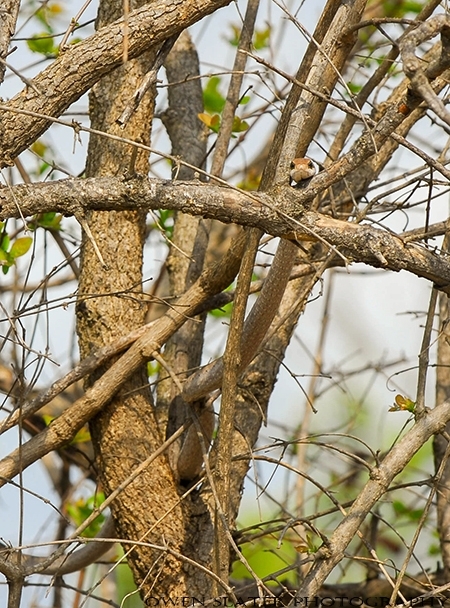 On this occasion, the most venomous land snake in Africa and one of the most feared snakes in the world peers out at me in a tree where it’s was beautifully camouflaged. Black mambas are known to be very aggressive and are not to be taken lightly. Needless to say, I gave this one all the space it wanted.